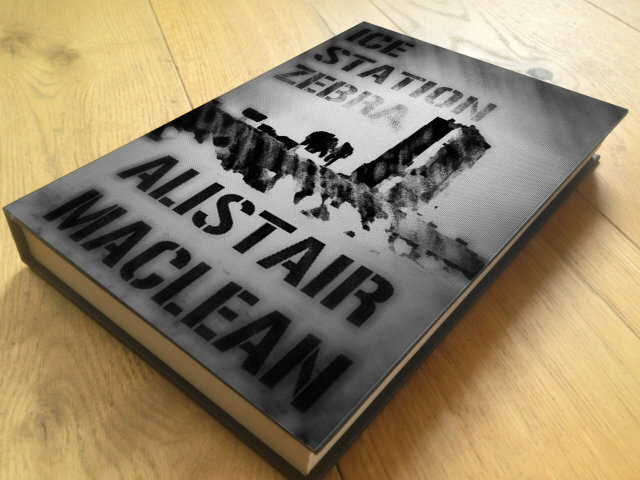 Ice Station Zebra was written by Alistair Maclean and published in 1963. It is a classic mystery/thriller set on a submarine in the Arctic. I like the military style-font here, the hunched figures in the centre dwarfed by the submarine, which is itself lost in the ice and facing an oncoming blizzard. Ice Station Zebra has a Mystery plot (see Spy Novel Plots). There has been an accident, and people are dead. The detective figure, Carpenter, discovers the accident was murder. He investigates. And the novel ends in a ‘parlour scene’ that could be straight from a country-house murder-mystery. What is missing is any real detecting. Carpenter finds a few clues, but there is barely any characterisation of the ‘suspects’. I guessed who the Soviet agent was long before the end, not because there were any pointers, but because he was the only person from the ice station who had more than a couple of lines. Instead, and Alistair Maclean is of course a thriller writer, there are action scenes (the walk through the blizzard) and disaster movie set-pieces (the torpedo tube flood and the fire in the engine room); these are well described and atmospheric, particularly the fire. The spy element is rather limited. Carpenter is obviously a British spy from the start. The murderers are Soviet spies. The motive is spy-related, but only revealed in the second to last chapter and is a ‘MacGuffin’ (e.g. it could be anything, it has no direct plot relevance). Maclean describes Carpenter as being in ‘MI6 counter-espionage’. Of course, there is no such thing, as that’s the role of MI5. Overall, although the plot hangs together it’s the weak characters that let the novel down. Carpenter has no real character traits other than being cold, tough and unflappable. The half a dozen interchangeable American sailors are all equally tough and unflappable but a bit jollier. The ice station survivors are indistinguishable from each other. The reader is left then really with just the ‘will they make it?’ factor of the action set-pieces to maintain their interest, and they are of course excellent. Alistair Maclean’s strong point is his ability to evoke the tension and adrenalin of men facing seemingly impossible odds. A straightforward book, part submarine techno-thriller and part murder mystery. The submarine thriller is the better part of the book. Ice Station Zebra was adapted in 1968, directed by John Sturges and starring Rock Hudson, Patrick McGoohan and Ernest Borgnine. The movie is only very loosely based on the novel, abandoning the murder mystery element. Instead it is a race-thriller between the Russians and US to the base (which is completely destroyed with no survivors) to pick up a downed satellite. The film ends in a military confrontation between the two sides. The novel is available on US Amazon here, and UK Amazon here. If you’d like to discuss anything in my Ice Station Zebra review, please email me. Otherwise please feel free to share it using the buttons below.